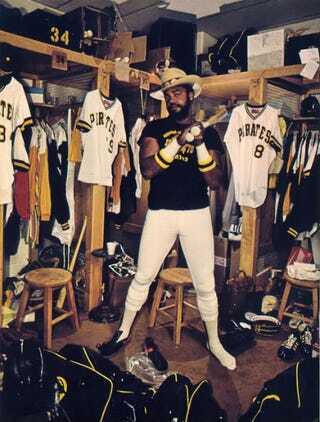 "He's like the 10th man in Softball out there," says First Baseman Stargell. "On a ground ball he's backing up first before I'm there to take the throw. We were both after a foul ball one time with our arms outstretched, and we came together face to face like two big pairs of scissors. It was the only time I ever kissed him. We hit and flew apart by yards and yards." Parker covers second on infield pop-ups, he gets involved in rundowns between second and third, he is everywhere. Pete Rose may be Charlie Hustle, but Parker hustles just as hard and considerably faster. On the bases, too, he takes all he can get. Says Parker, "The highlight of the game to me is scoring from first on a double in such a way that people look at me in amazement, as if they're saying, 'My, how fast that big man can move.' "
Big he is—6'5", 230 pounds. His legs terminate, after a lengthy run, in an upper body that looks like two Doberman pinschers bound tightly together. In addition to his speed afoot, he has general quickness—hence his nickname, Cobra—and a rifle arm. "He's one of those rare individuals who come along every 15 or 20 years," says Stargell. "Rare, and unique, and strong."